I just downloaded and installed Python 2.7.2 to my laptop and I am trying to run some sample programs. My laptop is running Windows XP. I am not a Windows person (mostly mainframes). However I am guessing that there is some command that I need to execute to define python as a command. Can anyone tell me what that command is? The installer placed Python at C:\Python27\. You need to add the python executable path to your Window's PATH variable. Highlight the Path variable in the Systems Variable section and click the Edit button. Apply the changes. You might need to restart your system, though simply restarting cmd.exe should be sufficient. Launch cmd and try again. It should work. Make sure you close the command window (with exit or the close button) and open it again. I had the same problem for a long time. I just managed to resolve it. Open a command window. Write set path=C:\Python24 (put the location and the version for your python). Now type python, It should work. The annoying part with this is that you have to type it every time you open the CMD. I tried to do the permanent one (with the changes in the Environmental variables) but for me its not working. Just another clarification for those starting out. When you add C:\PythonXX to your path, make sure there are NO SPACES between variables e.g. That took me a good 15 minutes of headache to figure out (I'm on windows 7, might be OS dependent). Happy coding. Open a new cmd window and try now. Close PowerShell and then start it again to make sure Python now runs. If it doesn’t, restart may be required. Further to @Udi post this is what the script tried to do, but did not work with me. I had to the set the following in the PATH nothing else. 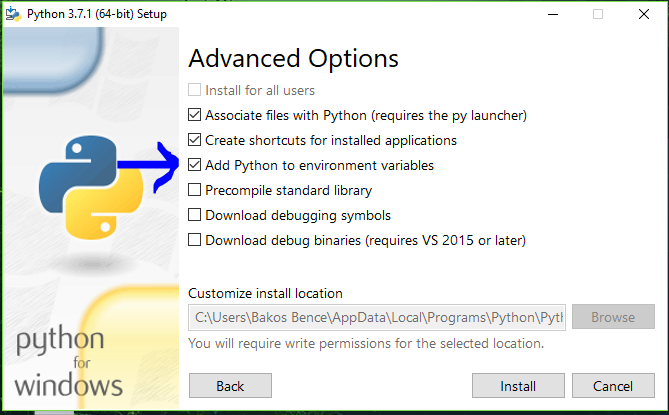 "Will be installed on local hard drive"
Another helpful but simple solution might be restarting your computer after doing the download if Python is in the PATH variable. This has been a mistake I usually make when downloading Python onto a new machine. After restarting my machine then Windows will often recognize Python in the PATH variable. Not the answer you're looking for? Browse other questions tagged python windows or ask your own question. Python is not recognized upgrading pip. How to upgrade? Why is the windows cmd not working for me?